I’ve been bitten by a bug the past couple of years that has infected me with a burning desire to make my own liqueurs. Not only great for my own use but they make terrific gifts. I started in 2010 with Limoncello and I’m still smitten. Delicious, gorgeous AND easy to make…pretty perfect in my book. I’ve been making my own liqueurs for years; after Limoncello opened the door, in rushed Cranberry, Coffee and Chocolate liqueurs. They all had one thing in common and that was vodka. I was anxious to try something new a couple of years ago and since Chambord Raspberry Liqueur has always been a favorite of mine it seemed the perfect choice. 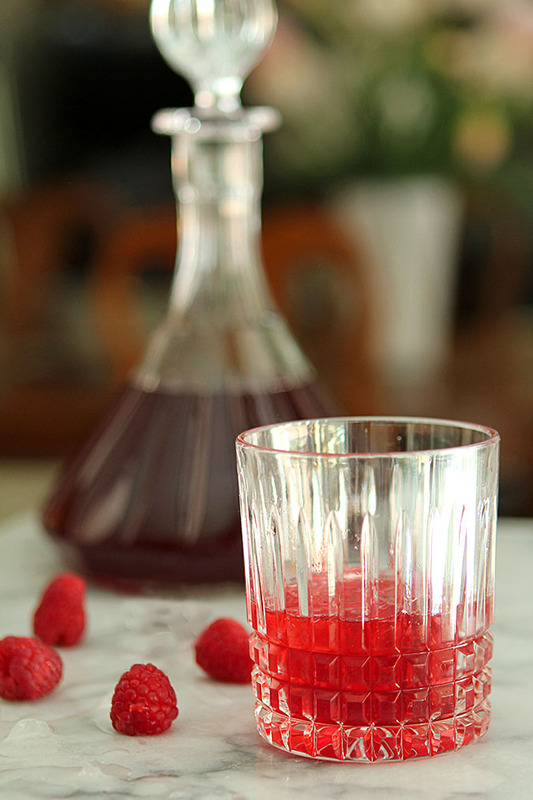 Chambord actually includes a variety of ingredients that I thought would make the efforts not just more complicated for me but for my readers too so I went the easy…and delicious…route of simply making a raspberry liqueur. Good call Barb…boy is this stuff good! Like a lot of posts I’ve been working on diligently in the past year; this is a refreshed old one. Ten years is an eternity in blogging time and the photos were simply awful. People that love me might say they were fine but they would be lying! Awful I tell ya, really awful. Since we are such visual beings, having an awful photo of a great recipe gets it no attention and so many miss out on what I know to be a special treat. 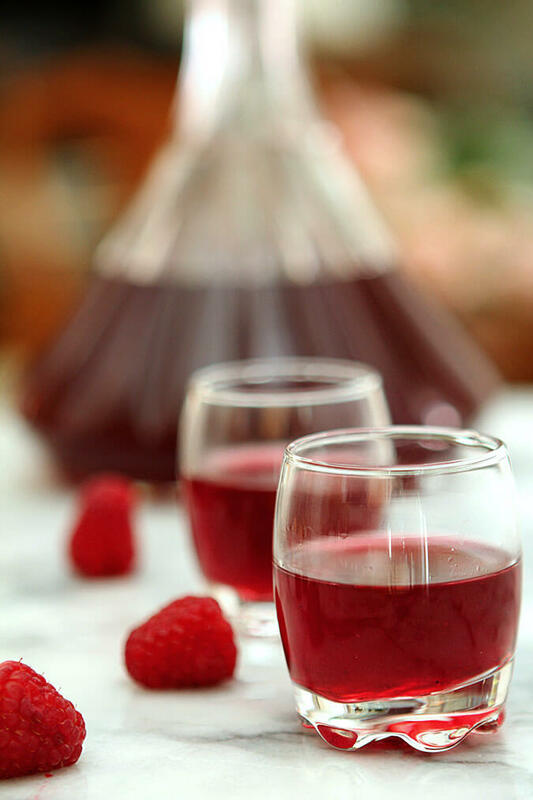 Since spring has sprung and raspberries will soon be flooding markets all over, I thought it perfect timing to get the word out…you can make Raspberry Liqueur yourself! Isn’t that beautiful? I recently had a recipe suggested to me by a liquor brand that had sent me a bottle of Cognac so I was game and I tried it and it was good. BUT. Always the but right? It was more expensive and more complicated than my other efforts and quite frankly it just didn’t have the same freshness that I had come to expect. Time to go back to square one and use the ingredients I’ve come to love that are so simple; vodka, sugar and fruit. It seemed that the stars were aligned for this one because I think it’s pretty perfect. I’ve only been brewing it for 3 weeks but wanted to try it now so I could get the post out for those also interested in trying their hand at making this and having it ready for summer sipping. Liqueurs get better with age as the vodka mellows more over time; so while I tried it at 3 weeks I’m thinking another 3 will give me an even smoother result. Want to have some ready for sipping on your patio this summer? Make it now! I’ve not used any of the vodka given to me so generously by brands I love; I’ll save those for another featured drink. What I used was Smirnoff; not just because it’s reasonably priced but also because they make a bottle of 100 proof vodka. Find it if you can as the higher the alcohol content, the better a job it will do of extracting the most from whatever fruit or citrus you use. If you can only find 80 proof, that’s fine too although 80 proof does not extract quite as much flavor from the fruit so you might have to let it stand for another week. I use this liqueur in so many ways. Over ice in low-ball glasses. Straight from the freezer in cordials. For a really festive event, I’ll serve it with some chilled Prosecco; this photo is actually from a party I did for Christmas a couple of years ago; it was perfect…not just delicious but so pretty for the season. Last summer I had dessert on my mind. I served little scoops of ice cream in cordial glasses topped with some of the liqueur and then just a touch of shaved chocolate. I’m not sure one was enough but it sure was delicious! This is just too easy; no excuses…get started now, I promise you won’t regret it! 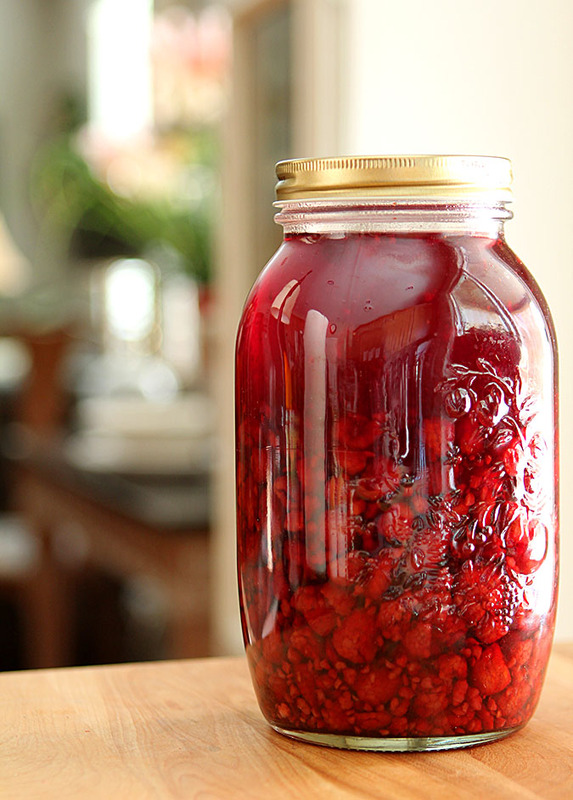 Pour raspberries into a large jar and cover with sugar. Pour vodka over all and close with lid. Shake several times the first day until all of the sugar has dissolved. Store in a cool, dark place for a minimum of one month (I recommend 6 weeks, longer is fine too). Shake every day or two. When ready, store in bottles. I like to keep one in the fridge for an icy after dinner drink! I used frozen berries because I wanted to start this early when all the fresh berries at the market were trucked in and super pricey. It turned out great so I say use what you can find. If it's mid summer and fresh ones are prolific...go for it! This liqueur is perfect for ladies night out. One question though, is there any substitute for raspberry? Can strawberries can be a substitute? Thank you. I’ve not done it with strawberries but I would; so I think I can say yes..try it and let me know! STILL haven’t made my own liqueur! My problem is that I’m within walking distance of two pretty good wine/liquor stores. So whenever I think about making my own, I just take a walk instead. 🙂 Anyway, this is great — glad to see it return. I’m intrigued by the Gin, I bet that’s good with the herbaceous notes and the Raspberries. I might have to try that! Just made mine today with neighbors homegrown raspberries. But made mine ith gin. I acquired several bottles of Edinburgh Raspberry Liquor (made with gin) several years ago and it’s almost gone! Can’t wait for six weeks are up. 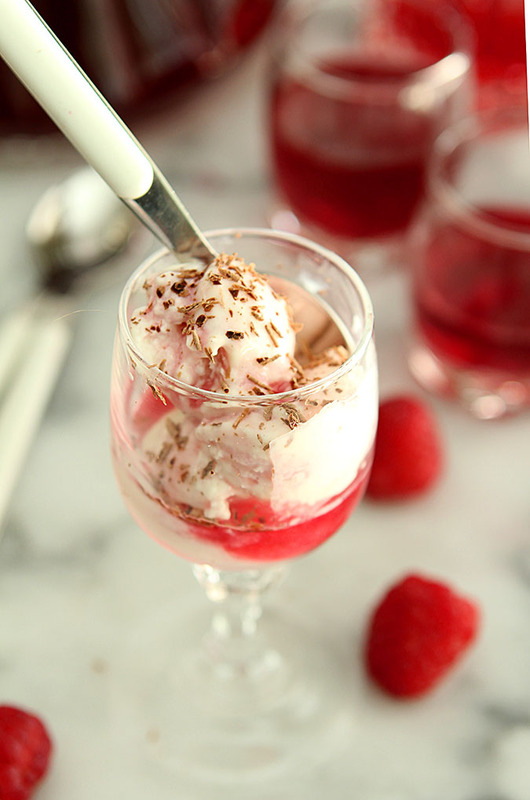 I’ll put a shot in a glass of Champagne and float a raspberry in the glass. Yum! Oh you’ll have to let me know how that works out; bet it’s good with the botanicals and the fruit! I will need more than 3.5 cups for sure. Do you recommend doubling or tripling the receipt in one large jar? What adjustments would you make? Or is it better to just do it by the quart…3-4 times? Either way. Ive made a huge amount when making as Christmas gifts and mixed it all in a 2 gallon container. Whatever is easier for you. What can you do with the leftover raspberries wince they are done infusing? I love them served on top of ice cream or shortcake with whipped cream. I whirred some in a blender too and spread them on English muffins! I am wondering about just 1 cup of sugar. Seems like it wouldn’t be sweet enough? I do peach, nectarine, Cherry and apricot blueberry also and it calls for a little more. I probably like it a little tart; it won’t hurt if you add more so do what you think would be satisfying for you. Hi. I’ve made strawberry liquer and used the leftover whole strawberries in a Strawberry Clafoutis. It was delicious! Sounds amazing…I think I must try strawberry liqueur now too; thanks Chris! I’m excited to have found your door! I’m going to try several of your recipes for Christmas gifts. I’m trying to get a feel for how much alcohol to purchase. I realize my mileage may vary, but roughly how many 250 ml bottles of finished product do you yield per batch? Do you get the same yield for most of your recipes? Yield is very similar to the amount you use; the sugar doesn’t add much to volume, so figure out how many based on how much alcohol you use. I simply put some cheesecloth in a strainer and pour it through. Finding muslin with a tighter weave then what you can find in the grocery store is a good idea. I get something called butter muslin from a store in Denver that sells products for homebrewers and it does a great job. If that’s not something you can find just double over several layers of regular cheesecloth in the strainer and let it strain through all of that. I would like low carb, have you tried this without the sugar? I have not Carol. Why don’t you try it in a smaller batch using a substitute and see how you like it? I have made a raspberry liqueur (about 6 wks ago)…..essentially the same recipe as yours…..BUT….according to an old recipe I had, I made it with Canadian whiskey instead of vodka. It’s still In the “brewing” stage. Have you any history of doing it with spirits other than vodka ? This is for a gift….I’m hoping it will turn out okay. Any thoughts on this? TKS ! I haven’t but I think I saw a couple of other recipes use whiskey too so you should be in good hands. I wanted it light; I love serving it with some Prosecco on New Year’s Eve! Hoping you can clarify something with your recipe… you call for “1/2 bottle of vodka (approximately 3.5 cups)” but a full 750ml bottle is just over 3 cups. Were you referring to one of the big “handle” bottles of vodka? Just want to make sure I’m understanding the right amount of vodka to use. I did have a large bottle Steve and should have clarified, it’s the only kind I can find with 100 proof vodka. Just use the cup measure for an accurate measurement. Thanks for the headsup! You can do that too…the recipe is definitely open to interpretation. I’m so excited to make this, as it’s raspberry season where I live now! I was just wondering, what is the yield for the liqueur recipe? I’m guessing maybe a quart/liter? Thanks! I didn’t remember to measure the end results Jess but it’s pretty simple to just add up the components and make a guesstimate. I’m thinking I need to don’t I. What I would LOVE to do is make something fabulous when blood oranges come into season. Not just orange but that gorgeous color too? I think would be perfect. And it’s easy too…makes it doubly irresistible! For years I’ve been doing limoncello for relatives and friends alike. Time to come up with something new… and this is it! Never thought about making my own Chambord. Great and tempting choice. Thumbs up! Thanks Sebastian…I love it. I don’t normally drink Chambord alone and probably won’t this either but mixed with a sparkling wine or in a cocktail it’s been great. Truth? LOVELY with plain soda water…just a nice apertif with little alcohol and calories. Might be addictive. 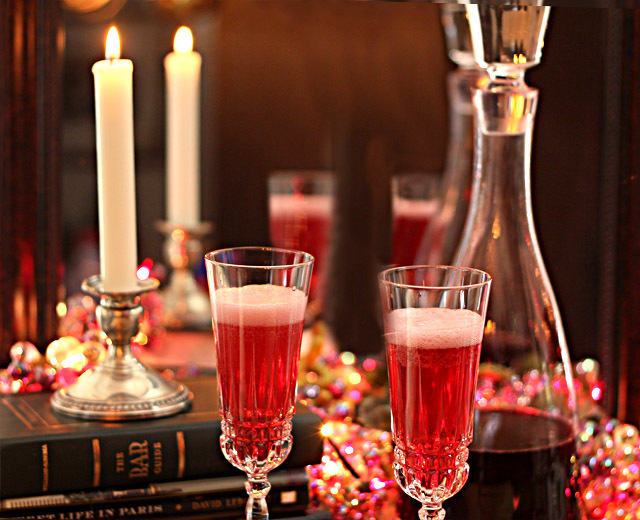 Take a look at my cranberry liqueur too…another winner. Great picture and recipe. I’ve never made my own liqueurs – I really should try it sometime. Really nice recipe. And as you say, cognac is just brandy from the Cognac region of France. Although there are some really pricey ones (I consider pricey $80 or above) there are also loads around $12 – $14 — cheaper than a good bottle of gin! Good thing, because I like brandy or cognac-based cocktails a lot! Really a nice recipe — thanks so much. Saw you post this on Twitter and knew it was being pinned asap. But oh gosh those photos are gorgeous and so Holidayish. … is that a word? Thank you Tara and I certainly think it’s a word…who makes those rules anyhow? If my favorite word, ‘yummalummadingdong’ works for me than certainly Holidayish is good too, right? Thanks for stopping by! I have a feeling it will last much longer but I have to test it first…I have Limoncello and cranberry liqueur from last year that are in unopened bottles that have not been refrigerated and they are both fine. I’m really happy with this Wendy; the cognac/brandy adds a lot to the mix! Perfect time of the year for this post. I’m in a celebrating (and drinking) mood! What I love the most? A friend brought over some no calorie lemon-lime sparkling water and it’s such a nice addition. No way am I going to be opening a bottle of sparkling wine for a cocktail for moi…but a can of soda? YES! It is wonderful Terra…and easy. Another one I just LOVE is the cranberry liqueur…I recommend both of them as a great holiday liqueur…not just so good but SO pretty too! Some very lucky people on your holiday list Skye…I think that’s very special and I’m delighted you are delighted with the end result…I love them both! I love Chambord, this is gorgeous! Oh, another lovely red drink for Xmas! This one I can do as, being summer here, I should be able to find fresh raspberries. Can’t wait to be sipping this with some champers, thanks Barb!. YEAH!! Finally huh? This is really good too…maybe a little pricier to make. Some recipes call for making an infused vodka but I like the complexity of this mix…it more ‘Chambordish’ and I like that! Gorgeous drink and photos! So beautiful. I’m certain it elevated the finished result! Such lovely pictures and a beautifully written post. What a beautiful liqueur for the holidays. I would love anything accented with this yummy stuff. Lovely Barb! I’m always so impressed by your homemade liqueurs. After making your Limoncello, I now think I’ll be moving onto Chambord! I like the idea of mixing it with champagne as well. I just so happen to have some in the fridge right now. I think this is a match made in heaven. Mmmmm I don’t think this is wasting cognac… just giving it a flirty, fruity little kick! Looks fabulous (as do the Cosmopolitans!) wow. And now I am thinking of all the chocolate desserts I could make that would love a few drops of this….